The Indira Gandhi Rashtriya Manav Sangrahalaya (National Museum of Mankind) is a unique Museum, spread over 200 acres of undulating land on the Shamla Hills on the Upper Lake front. It is situated in a prehistoric site and may be the only museum in the world strewn with numerous prehistoric painted rock shelters. It is a post colonial museum of communities rather than objects, dedicated to in situ revitalisation of local knowledge systems and life enhancing traditions rather than ex situ display of objects. It is engaged in recollection rather than collection. The museum display has been curated directly by the folk and tribal communities, camping at site, to create a miniature presentation of Indian folk ways through display of ecospecific habitations & subsistance practices in the tribal, coastal, desert, and Himalayan habitats.The library, audio-visual archive, computerised documentation and the collection of ethnographic specimens in the Museum, though modest in size are among the best in the world. One of the most unique national institutes in India, Bharat Bhawan is a centre for the performing and visual arts. Designed by renowned architect, Charles Correa, the contours of Bharat Bhawan merge in exquisite harmony with the landscape creating a visual impact of spacious and natural elegance. The centre houses a museum of the arts, an art gallery, a workshop for fine arts, a repertory theater, indoor and outdoor auditoria, a rehearsal room and libraries of Indian poetry, classical and folk music. Open from 2 pm to 8 pm everyday except Mondays. A fine collection of sculptures are on display here from various parts of Madhya Pradesh. Highlights of the collection are: paintings of various schools, copies of paintings from the Bagh caves near Mandu and the statues of Alakshmi and the Buddha. The museum is closed on Mondays. 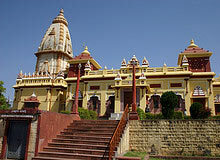 This beautiful temple on the Arera Hills has a Museum attached to it which houses a collection of sculptures from Raisen, Sehore, Mandsaur and Shahdol districts of Madhya Pradesh. The museum is open from 9am to 5pm everyday except Mondays. This safari-park is located on a hill adjacent to the Upper Lake, with an area of 445 hectares. In these natural surroundings, wildlife watchers can view a variety of herbivorous and carnivorous species. Open everyday, except Tuesday, from 7-11 am and 3-5.30 pm. Facing the Lower Lake, the fish-shaped aquarium houses a number of fascinating species of fish in all shapes and sizes. Basically a science museum, located on the picturesque Shamala Hills, Regional Science Centre houses about 300 participatory exhibits distributed equally in 'Invention' & 'Fun Science' galleries, and a 'taramandal' (Planetarium). The museum remains open from 10.30 am to 6.30 pm on all days except Mondays. Architecturally akin to Delhi's Jama Masjid, this imposing mosque was built by Sikander Jehan, daughter of Kudsia Begum, in 1860. Situated at the entrance to the Chowk area in the heart of the walled city, Shaukat Mahal is an architectural curiosity. Its mixture of styles in Occidental idioms sets it apart from the predominantly Islamic architecture of the area. It was designed by a Frenchman, said to be a descendent of an offshoot of the Bourbon Kings of France. Post Renaissance and Gothic styles are combined to charming effect here. Nearby is the elegant once-opulent Sadar Manzil, Hall of Public Audience, of the former rulers of Bhopal. The Taj-ul-Masajid is one of the largest mosques in Asia, built by Nawab Shahjehan Begum around a courtyard with a large tank in the centre and with an imposing double storeyed gate-way with 4 recessed archways and 9 imposing cusped multifoiled openings in the main prayer hall. The Quibla wall in the prayer hall is carved with 11 recessed arches, while the mimber is made of black basalt. The structure is enlivened by the limpid expanse of water in the tank outside the northern wall. The monumentality of this structure was much greater originally when it faced the towering bastions of the Fatehgarh Fort. A three-day Ijtima congregation held here annually draws people from all over the country. 11 km away on the Bhopal- Berasia road, Islamnagar was the palace of Bhopal's Afghan rulers and was built by Dost Mohammed Khan. Formal gardens surround the palace and the pavilion. The latter a synthesis of Hindu and Islamic decorative art, has columns lavishly embellished with floral motifs. Other monuments to see are the Hamam of the Chaman Mahal and the double-storied Rani Mahal. 17 km from Bhopal. A dam and a beautiful picnic spot. 45 km from Bhopal is the ancient fort of Raisen on the Bhopal-Sagar road. The fort was built in the early 6th century. It is situated on a high hill and once had 84 lakes and ponds, of which only 15 remain. The fort was under the famous Hindu king Rai Puran Mal before it was seized by Sher Shah and brought under Afghan control. 62 km from Bhopal. Situated in a lovely forest glade, Delawadi is a picturesque picnic spot, rich in scenic splendor and natural beauty. The historical fort standing on an isolated hill about 1,127 metres long and 266 metres broad is situated 3 km away from Delawadi. Buses ply the route, but from Delawadi to the fort one has to travel on foot. 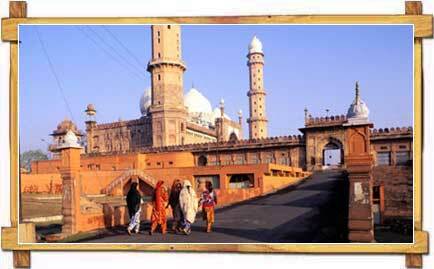 The fort was once a stronghold of Gonds, but fell to Mohammad of the Bhopal State. As one of the world's largest collections of painted pre-historic Stone Age rock shelters and cave paintings dating back to 10,000 BC, it is rather awe-inspiring.Surrounded by the northern fringe of the Vindhyan ranges, Bhimbetka lies 46 km South of Bhopal. In this rocky terrain of dense forest and craggy cliffs, over 600 rock shelters belonging to the Neolithic age were recently discovered. Here, in vivid panoramic detail, paintings in over 500 caves depict the life of the pre-historic cave-dwellers making the Bhimbetka group an archaeological treasure, an invaluable chronicle in the history of man. From the hilltop palace complex of Dost Mohammed, visitors can see the Chaman Mahal and the two-storied Rani Mahal. The world famous Sanchi Stupa and the Vidisha caves can be seen on a half-day trip from the hotel.Sanchi, renowned and venerated as the site of the oldest Buddhist Stupa in the world, also has Buddhist temples, monasteries and pillars dating from the 3rd century BC to 12 the century AD. The profound peace pervading the area is as much of a draw as everything there is to see there. The Sanchi hill goes up in shelves with Stupa 2 situated on a lower shelf, Stupa 1, Stupa 3, the 5th century Gupta Temple No.17 and the 7th century temple No. 18 are on the intermediate shelf and a later monastery is on the crowning shelf. The balustrade surrounding Stupa 2, carved with aniconic representations of the Buddha, was added in the late 2nd century BC under the Satavahanas. The adjacent Gupta temple no.17 was hailed by Sir John Marshall as one of the most rationally organized structures in Indian architecture. Though small, it was a herald of all the principles which went into the engineering of an Indian temple in the early medieval period. The Buddhas in the perambulatory surrounding Stupa 1 are not contemporary with the Stupa but belong to the Gupta period in the mid 5th century AD. The monastery and the temple with the tall pillars adjacent to Stupa 1 and the temple near the monastery on the crowning shelf illustrate the evolution of the architectural form after the 5th century Gupta temple. Below the hill, the Archaeological Survey of India Museum houses some of the earliest known stone sculptures in Indian art from the 3rd to the 1st century BC. Regular flights connect Bhopal with Delhi, Gwalior, Jabalpur, Indore and Mumbai. Bhopal is on the Delhi-Chennai main line. Major trains going from Mumbai to Delhi via Itarsi and Jhansi also go through Bhopal. Regular bus services connect Bhopal with Indore(186 km), Mandu(285 km), Ujjain(188 km), Khajuraho(383 km), Pachmarhi(195 km), Gwalior(423 km), Sanchi(46 km), Jabalpur(295 km) and Shivpuri(311 km). Daily connections from New Delhi & Mumbai. Daily connections from New Delhi. Bhopal is on the New Delhi - Chennai main line. Major trains going from Mumbai to Delhi via Bhopal. Shatabdi Express - daily Delhi - Bhopal - Delhi. By this train 8 hours day journey. Nizamuddin - Habibganj Express daily Delhi - Bhopal - Delhi. By this train 10 hours overnight journey. Best Season : October - March.